Wealth differences between individuals occur for many reasons, with variation averages across countries and considerable disparity within their populations. 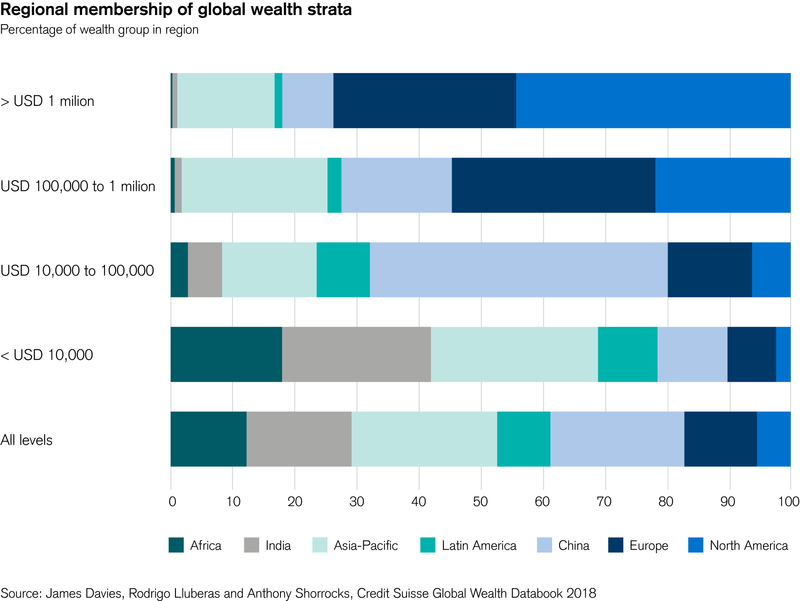 The Global Wealth Report 2018 has found that younger age groups with little chance to accumulate assets disproportionately compose the low wealth global ownership. Regional disparities are strongly present where prospects for wealth creation are very limited, such as in Africa. Opportunities are also sometimes constrained for women or minorities. At the other end of the spectrum, there are many individuals with large fortunes acquired through a combination of talent, hard work and good luck. 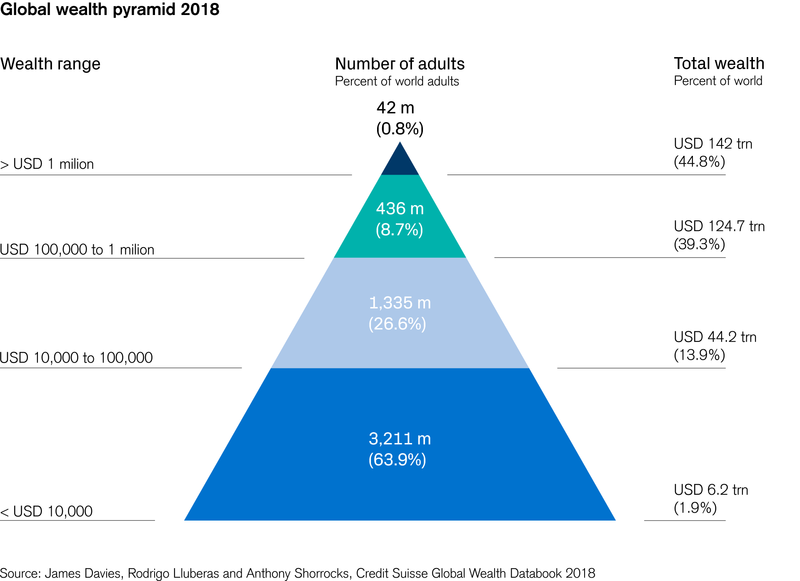 The large two tier base in the pyramid consists of 4.5 billion low average wealth holders who possess an overall combined wealth exceeding USD 50 trillion, a significant amount often overlooked. The lowest layer has the most even distribution across regions and countries, but also the widest spread of personal circumstances. In developed coun­tries, approximately one third of adults fall within this category, mostly with a transitional status due to business losses, unemployment, or a life-cycle phase associated with youth or old age. In contrast, more than 90 percent of the adult population is within this range in India and Africa, examples of low-income regions where life membership of the base tier is the norm rather than the exception. The mid-range band of USD 10,000 to USD 100,000 in the global wealth perspective is composed of 1.3 billion adults totaling a considerable economic clout of USD 44 trillion in net assets. China encompasses almost half of this band's global members, completely dominating this proportionally high middle-class segment worldwide. The contrast between the mid-range wealth ownership in China vs India is particu­larly striking, with 59 percent of adults comprising the Chinese middle class to only 8.6 percent of adults in India. 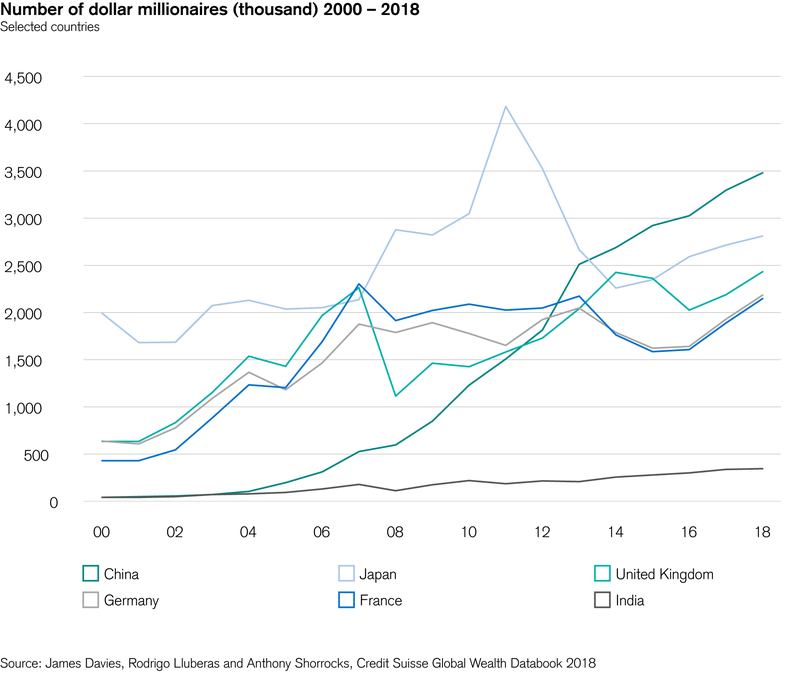 Europe, North America, and the Asia-Pacific region (omitting China and India) form collectively 79 percent of the total adults with net worth above USD 100,000. Europe alone hosts one third of the total, roughly double the number in China. However only 1.1 percent of the global total reside in India and 0.6 percent in Africa. The United States has by far the greatest number of millionaires: 17.3 million or 41 percent of the world total. Japan held second place in the millionaire rankings by a large margin for many years until China surpassed it around 2014. Since 2000, Chinese millionaires have grown by a factor of more than 80 to the current level of 3.5 million (8.2 percent of the world total). The most remarkable observation is that India had a similar number of millionaires to China in 2000, but it now hosts just one tenth of the current Chinese total according to our estimates. Interestingly, Europe and North America had similar numbers of high net worth HNW (USD 1 million to USD 50 million). individuals in 2007–09, but North America's HNW global composition increased after 2009, growing significantly from 2013 onward. In addition to their considerable size, the lower and middle tiers of the pyramid constitute a massive total wealth which yields opportunities and needs. If addressed, these can drive new trends in both the consumer and financial industries. Indisputably, the pinnacle of the pyramid will likely continue to be the main driver of private asset flows and investment trends with worldwide 42 million HNW and 149,890 UHNW adults. The most remarkable growth showing in China, with 11 percent of the total global ultra-rich, almost 200 times of its number at the turn of the century.